A salicylic acid peel is unbeatable as a treatment for acne, blackheads, large pores and pimples! A course of frequent light peels is even better, and if done properly and safely, can clear up those issues for good! What makes a salicylic peel so good for acne? How to prepare and apply step by step? The best frequency for your home regime, expectations, and maintenance? 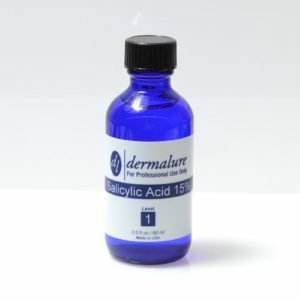 Why is a Salicylic Acid Peel So Beneficial for Acne? Derived from Willow bark, it is the sole star of the Beta Hydroxy Acid group (BHA). Also a main constitute of Aspirin. Anything higher is too strong in the beginning and can be very irritating. > There really is no need to go straight into a stronger dose, as the effectiveness of peels depends on where you skin is at. In other words – the effective of using 15% in the beginning is the same as using 30% after a few months of usage. Skin gets used to it, and gets stronger, so can handle (some would say needs) higher concentrations. Repeat – don’t be tempted to go straight into using a concentration any higher than 15%. Frequent light peels are fair more effective, not to mention safer. Or, for the same benefits but safer and easier – start with a daily application of a lower dose. 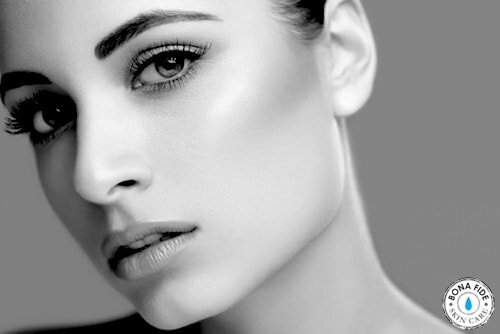 Aim to perform a 15% salicylic acid peel every 2 weeks, for 2 or 3 months. The first peel will be for 1 minute. Notice how your skin reacts and increase in 1 minute intervals each time for a maximum of 5 minutes. This time frame of 2-3months will show great results – often after the very first treatment. It will allow the benefits to be cumulative, and for a lot of people this is all they need to see vast improvements in acne and other skin conditions. Maintain results with a monthly application of 15 – 20%. If you still have blockages, scars or concerns, repeat the treatment plan with a concentration of 20%. Build slowly. Vaseline – apply to eyebrows, lip area and nostrils, you don’t want the acid touching those! Another option is to use a gauze pad, soak it in the solution and apply like a toner. If you choose this method wear gloves! You can see great improvements after the first treatment. It will take a few weeks to see vast differences. Some people no longer have a problem with blackheads – they completely disappear, and breakouts are greatly reduced. Fine lines, pigmentation and acne scars are also helped by using this peel frequently. Results are cumulative, so keep up your treatment plan. Once you’ve achieved your wanted results, a peel every month or two is enough to maintain these benefits. A 15% concentration, with no other active ingredients that will get in the way of the best results. A small bottle is enough as you don’t need to use a lot, and may want to increase the concentration to 20% after you’ve finished it – this is an easy way to build up. This is a 30ml bottle, great size for starting and a good price. This range* also has 20% and 30%, if you are looking at increasing. The blue bottle is important – keep it out of sunlight! Not sure about using a heavier peel? Get the same results with consistent use of a 2% application. It’s a lot easier, safer and will help keep your skin clear. Using salicylic acid peels as an acne solution can be remarkable. Often it is the one thing that can help clear up skin, once and for all. The exfoliation action also stimulates cell renewal – which helps with healthier, stronger skin in the long term. This is much more beneficial than using benzoyl peroxide, which works by drying up blemishes and oil, and can be effective but severely drying. BP can also completely unbalance skin, making the problem worse in the long run. Used with knowledge and caution, home chemical peels are a great, easy way to take care of your skin. Hi. I was wondering if I could continue using the 2% on a daily basis in between peels. For better spot prevention? In a previous article you mentioned that it would be wise to build up a tolerance this way. So, can it be used daily and in between the 4-6 peels you do every so often? Sorry for the delay in reply Nena! Yes you can use foundation within a week of doing a peel – the only reason why you might not is if your skin is peeling, so the foundation would just look flaky. But the foundation itself is fine to apply. Just make sure you are cleansing it off gently at night. Of course, if your skin is sensitive after the peel, you want to be careful applying something that could upset. Foundation should be fine, but keep an eye on your skin and remove it if needed. Its been exactly a week since my 15% at-home SA peel. The peeling itself stung like hell for the first 30 seconds but went away as mentioned above. The first day my skin was tight and slightly red but looked good. The second day the peeling started around the mouth and moved across the face evenly. Now a week later, my skin feels great and this morning I noticed the last bit of peeling skin had flaked away. My question is, since my skin feels about 100% healed, can I start my next peel today? Sorry for the late reply, which may not be helpful now since you’re asking about timing… however this may help you or someone in the future 🙂 Ideally you would want to wait at least two weeks, especially in the beginning. I understand the temptation once your skin starts looking great, but especially since you mentioned it had just stopped peeling, it is worth giving it longer to heal. Remember, there won’t be anything to “peel” this soon, so another peel will likely just irritate because it will be sitting on top of very new skin. Keep in mind this is general advice, as I can’t see your skin or give specific advice over the internet. However, it is worth taking it easy in the beginning, noticing how your skin reacts, and then adjusting. You will have a good idea of the right schedule for you after two or three peels because you’ll be used to the process. In general it should just be one. You might want to layer it if your skin is used to that particular strength (don’t do any more than two layers) – I would recommend trying this in a small area first, and do lessen the amount of time it’s left on skin. Please remember to always use caution, and follow the specific instructions on whatever product you are using. This page and comments are general information only. All the best! How often can I do this process at the beginning? I have read from every couple of days to twice a month? Hi – in the beginning I would recommend about once a week. Once you have performed a few peels you will have a good idea of how your skin reacts (dryness, sensitivity, etc) and how long it takes to “recover”. You don’t want to do another peel while your skin is still dry after the last one. I wouldn’t recommend doing any more than two a week no matter how many you’ve done, that’s a bit much for your skin. Hope that helps! I just got a sa 30% pell and a small dark pack has appeared on my pimples what should i do??? SHIVANI A/P M SELVAM . Can I use salicylic acid from the lab ? Thank you , so I apply the acid then the bicarbonate soda then just splash water onto face .